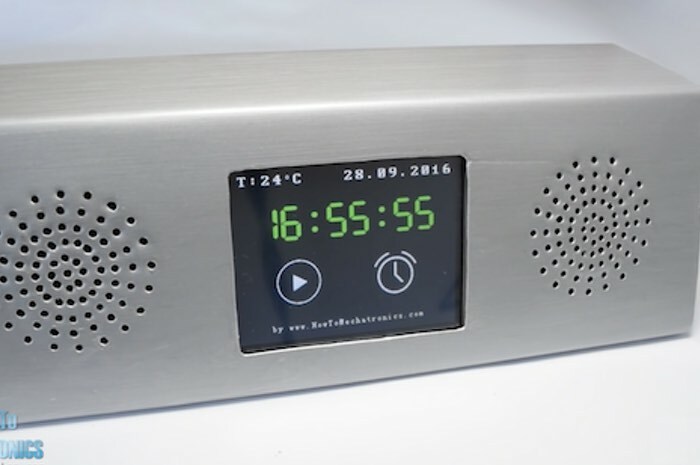 Dejan Nedelkovski has built a stylish DIY touchscreen Arduino music player and alarm clock which has been created using a folded piece of sheet metal to provide a minimalist yet clean enclosure to house the Arduino electronics, speakers and display . The new Arduino project is powered by an Arduino Mega, that has been compounded with a RTC module and 3.2 inch touchscreen, which is used to display the time and current song as well as provide a navigation interface for you to select the tracks you would like to listen to. It uses an Arduino Mega board and a 3.2” TFT touch screen with a suitable shield for connecting the screen with the Arduino Board. For playing the music, it uses the BY8001 MP3 Player module and for the alarm clock it uses the DS3231 Real Time Clock module. The home screen features a big clock, date and temperature information, as well as, two buttons for the Music Player and the Alarm Clock. If we enter the Music Player we can start playing the music by pressing the big “Play” button in the middle of the screen. Right beside it, there are two more buttons, for playing the previous or the next song. Above these buttons there is the song progress bar, and at the bottom of the screen we have a volume bar and two buttons for decreasing and increasing the volume. In the upper right corner there is a clock and on the left side is the “Menu” button which brings us back to the home screen. On the other hand, if we enter the Alarm Clock we can set an alarm by using the two buttons for setting the hours and the minutes. Full instructions on how to create your very own Arduino music player and alarm clock have been kindly published by Dejan Nedelkovski with all the code you require. Jump over to the official site via the link below. If you enjoyed this article you are sure to enjoy how to build your very own Arduino wind speed meter or anemometer project which is easy to build with basic Arduino skills.